Does your company work with long goods such as wood strips, pipes or bars? Then you require a storage system that provides organisation and security for your goods. 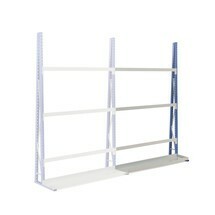 A double-sided vertical rack offers all this and more. With the base unit for a single-sided vertical rack, you can greatly simplify the workflows in your warehouse. Thanks to the separating elements, you can easily distinguish your different, vertically stored goods. This ensures that the right product is always easily found. Do you work with light goods such as panels and strips? Then you require a secure and space-saving storage solution. The META vertical rack base unit is quickly assembled to provide well organised storage for your light goods. If your operation uses light goods such as panels and strips, you require a reliable and well organised storage solution. 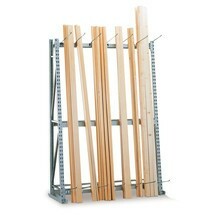 A double-sided vertical rack from META is quickly assembled to offer secure storage space for your goods. Do you require additional storage space for long goods to supplement your existing double-sided vertical rack? The add-on unit is quickly and easily attached to your existing rack to provide additional storage space for your long goods. 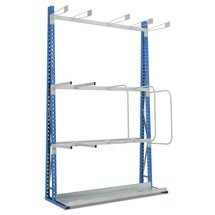 Do you require additional storage space to supplement your existing single-sided vertical rack? A matching add-on unit will deliver extra space and bring order to your warehouse. You simply bolt the add-on unit to the existing rack. Do you require additional secure storage space for your light goods? The add-on unit for a single-sided vertical rack from META is quickly assembled to expand your existing META rack with additional storage space. Material can be easily and efficiently sorted with this separating arm for the META vertical rack Manufactured from steel and galvanised, it is durable and corrosion-resistant. Does your operation use light goods such as strips, profiled wood or panels? 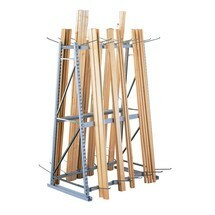 The META vertical rack offers secure, space-saving storage for such items. You can also expand the usable space with matching add-on units.